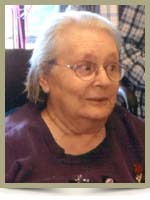 MacKay, Anna Marie, 81, of Queens Manor, Liverpool, passed away peacefully on Saturday, April 21st, 2012, in the Queens General Hospital, Liverpool. Born in Bridgewater, she was a daughter of the late Ness and Jessie (Ramey) Rafuse. Anna was well known for making many lovely crafts, she also loved to knit and sew. She was also an big Nascar fan, always rooting for Dale Earnhardt Jr.
She is survived by daughters Jean (Rick) White, of Blandford, Lynn (Darryl) Whynot, of Brooklyn; granddaughters Terri-Lynn (Dwayne) Foster, Lesley Whynot; Great Grammy “K” to Joshua, Jacob, Abigail Foster; brother John (Betty), of Bridgewater; many nieces and nephews. She was predeceased by her companion Roy Grant. Cremation has taken place under the direction of Chandlers’ Funeral Home, Liverpool. A private family service will be held at a later date. No flowers by request. Donations may be made to the Queens Manor, P.O. Box 1283, Liverpool, N.S., B0T 1K0, or to S.H.A.I.D Animal Shelter, 450 LaHave St., Unit 17, Suite 138, Bridgewater, N.S., B4V 4A3. The Family would love to thank the staff of Queens Manor, nursing staff at Queens General Hospital and to Dr. Jennifer MacDonald, for the wonderful care they provided to their Mom & Grandmother during her stay. Darrel, Lynn and Jean. I am very sorry to hear of your great loss. My thoughts are with you and your families. Take care. I am sorry to hear of Ann’s passing. She is at peace and fondly remembered by many. Dear Jean, Lynn and family: I was saddened to read of your mom’s passing. I can remember her and my mom laughing together. I believe she worked at the Stedmans Store here in Liverpool. Always a kind word and a smile whenever our paths crossed. God Bless. On behalf of Jacques and I , I would like to express our sincere condolences. Our thoughts and prayers are with you and your family during this difficult time. Dear Jean & Lynn … may God’s blessings be with you and your families at this time… we send you all our heartfelt condolances in the passing of your mom… she was a special Aunt to me. So sorry to hear of your mom’s passing. My thoughts are with you and your families at this sad time. Jean and family, so sorry to hear of your moms passing, hugs to you and yours. Please except our heartfelt condolances in the passing of your mom and Grandmother. So sorry to hear of the passing Anna. It’s been many, many years since I saw her or any of you; but, I remember coming to your home as a little girl and what a special lady she was. My prayer is that the Lord will provide peace and comfort to your family now and in the days ahead as you walk through this valley. Blessings to each of you. I am so very sorry you have lost your Mom. I certainly remember the great times we had when we lived on Summer Street. Lots of laughs and great friendship. When Anna worked at K & W Enterprises, she made us a wonderful hard bound book for Christmas in 1973. She had our names printed in gold foil ink on the front. Very Special. I have it and used it, remembering Anna fondly. When she moved to Bridgewater, I would often stop in to visit her and your grandfather. Great times and great memories.